November 17th, 2015. Bandai Namco US has announced they will be livestreaming the English translation of Digimon Story: Cyber Sleuth on December 1st, 2015. 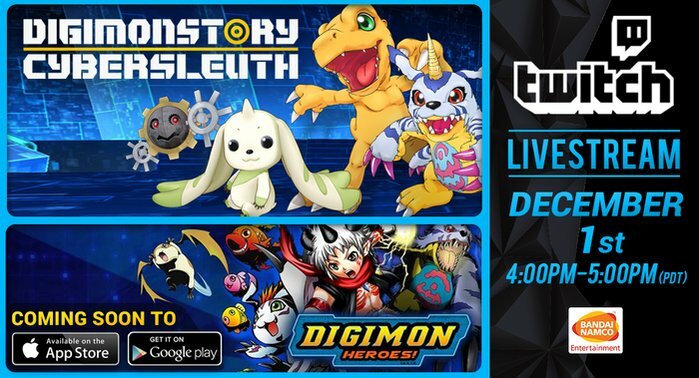 The news comes on the heels of Bandai Namco UK's own stream announcement for November 19th, during which there will be a giveaway of Digimon plush toys. According to Bandai UK, the company will be giving away an Agumon plush toy if they reach one thousand viewers during the stream. The US stream will be held on their Twitch channel from 4 PM to 5 PM Pacific Daylight Time/7 PM to 8 PM Eastern Time. Bandai US' ad for the American stream also mentions Digimon Heroes!, the English translation of the smartphone game Digimon Crusader, due to launch this fall. Heroes! is currently only available in Australia and Romania, and the ad may point to a final launch date for the United States and other regions being announced during their stream. The English edition of Digimon Story: Cyber Sleuth will launch in the United States on February 2nd, 2015, on the PlayStation Vita, PSTV, and PlayStation 4. Its Chinese translation will debut in Taiwan later this month, on November 25th, 2015. The international editions of Cyber Sleuth will include new difficulty modes, as well as two new Digimon not found in the Japanese game.